We're finally back!!!! SO SORRY it took us so long (we are just very slow) but we're back and we think this chapter came out pretty awesome (I mean sad) so hopefully you guys will come along for the ride! Thanks so much for your patience and support while we got this chapter written and planned! 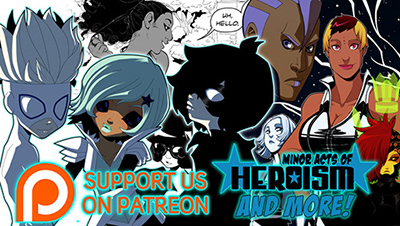 And if you missed it, we posted the chapter cover on Monday so check a page back for a new image you might have missed! Also, we'll be at ECCC! Table 508! So come say hi if you're there! OMG LOOK AT THAT ADORABLE LITTLE BABY BOOOOOOO AHHH!! So excited! And welcome back!! YAAAAAAAAAAAAAY Welcome back, guys! Page looks great D: Can't wait to see where this goes! She is the sweetest thing ever ... too bad for my new niece. Thanks for this! So glad you guys are back - that sweet bb is so cute! Awww, baby Nilus is so adorable. Yay for babies ever after!